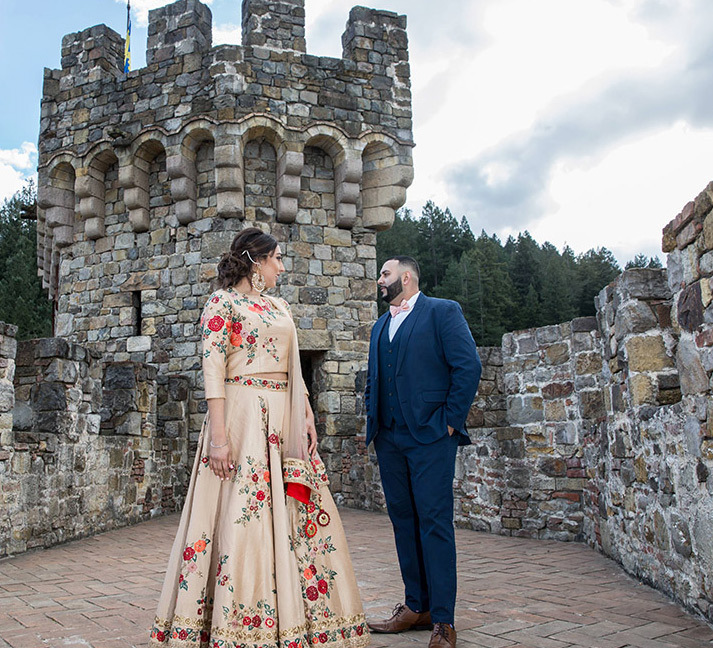 Vidhi and Anant’s wedding celebrations at a historic country estate featured a magnificent setting, lush backdrops and picture-perfect decor. Vidhi and Anant were clear that they wanted an outdoor wedding. So they planned their wedding celebrations in beautiful outdoor locations in North Carolina and incorporated gorgeous decor that fused natural and manmade elements. Check out the highlights below. Despite growing up in Tampa Florida, and having mutual friends, Vidhi and Anant first met in Kansas City where they attended medical school. Vidhi reached out to Anant for advice when she first moved there, and she got more than what she bargained for! After seven years of a long-distance relationship and two doctorate degrees later, they finally decided to tie the knot. Vidhi and Anant went on a vacation to North Carolina as Anant wanted to see the rugged terrain and beautiful landscapes of the Smokey Mountains. Vidhi, on the other hand, wanted to explore the rich history the area had to offer. When the couple visited Biltmore Estate, they knew it offered the perfect balance of what they wanted for their wedding as it was a place that was reflective of both their personalities. The Biltmore Estates proved to be the perfect venue for their wedding with its stunning views as well as elegant spaces to host elaborate celebrations. 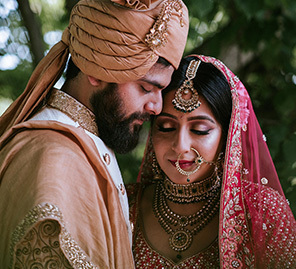 The couple had always envisioned colorful pre-wedding functions like the sangeet and mehndi to be vibrant affairs filled with love and fun, and that’s just what they managed to achieve. These functions were held at the North Carolina Arboretum which is a beautiful property featuring landscaped gardens and pretty settings. A combination of red, cream and gold formed the theme for the decor. The use of drapes, bright colors, and fresh florals added pops of color and light. While the bride changed her outfits for these functions, the groom complemented her in his dapper outfits. Guests enjoyed taking lots of Polaroid photos, and the delicious food and drinks were enjoyed by all. Blush, cream, and floral accents set the tone for their gorgeous nuptials. Hydrangeas, roses, and ivy were used as the main decorative elements which made the venue look like something out of a dream. The classic garden theme worked well with the venue that was decorated in pure white and lush green hues. The mandap was beautiful with its pastel colors, and the decorated chairs provided a picture-perfect contrast. 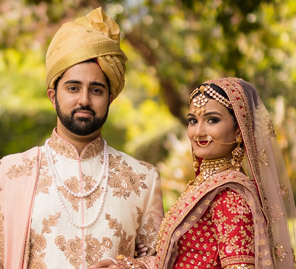 Vidhi wore a pure ivory and gold lehenga by Anju Modi, while Anant opted for a regal sherwani. The Gatsby-themed reception included a color palette of muted white and gold. The couple paired the soft colors with a dance floor, and the setup looked like an absolute dream. The dazzling reception was held under a tent-like structure beautifully decorated along with long family-style tables and hanging chandeliers over the dance floor. The dinner menu combined the couple's favorite dishes, and they danced the night away with their friends and family. Vidhi wore a dazzling Manish Malhotra creation, and Anand opted for a classic tuxedo.